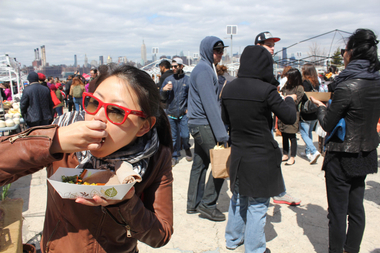 Smorgasburg returns to the East River State Park and Prospect Park this weekend. WILLIAMSBURG — Get ready for a feast. Smorgasburg, the sprawling open air food vendors' market, returns to the Williamsburg waterfront this weekend featuring 25 new stands peddling wood-fired pizza, Venetian sandwiches and waffle ice cream cones. The 25 additions join dozens more for the outdoor food bonanza that will take place Saturdays at the East River Park and Sundays in Prospect Park through the spring, summer and fall months. Co-founder of Smorgasburg Eric Demby shied away from picking favorites among the new food offerings at this year's market. "I'm most excited about everyone of course," he said. This year, he said, organizers managed to coax the vendors at Big Mozz, who had been selling fresh mozzarella in previous seasons, into the pizza-making game. "You guys make tomato sauce and mozzarella," said Demby. "There's this famous dish that involves both off them." Big Mozz will have portable wood-fired pizza ovens where they'll bake up their fresh pizza, he said. Demby highlighted other delicious options like Red Table Catering that makes tasty breakfast sandwiches on homemade English muffins, Wowfuls that make cone-shaped fresh waffles stuffed with ice cream and Tramezzini NYC, a pair of Italian brothers who stuff sandwich pockets with meats and cheeses sourced from Italy. Gearing up for the festival's first spring weekend, Demby offered visitors advice as an old pro, accustomed to tasting as many treats as possible. "Definitely don't go to brunch first. I like to have a yogurt at like 10 a.m. and then go at noon," Demby said. "I find I can eat more then than if I starve myself. "Also go with friends and share. That's really the best way to do Smorgasburg." Smorgasburg comes to the East River State Park at 90 Kent Ave. Saturdays from 11 a.m. to 6 p.m. On Sundays the food vendor market heads to Prospect Park. For a full listing of vendors visit Smorgasburg's website. Here are some more highlights. Chow down on Chicago-style Italian beef sandwiches garnished with provolone and sweet and spicy pickled veggies. Tempt your sweet tooth with artisanal banana pudding that comes in a plethora of flavors beyond just banana like like strawberry, s’mores, and matcha. Matcha green tea banana pudding?! Our Matchananas is just one of our 14 flavors on our website. Ch-ch-check it out! Link in bio. : @sarahginderphotography . A strange and gelatinous concoction, raindrop cake is made from solidified water, and no that isn't just code for ice. The Choripan will sling up the traditional Argentine street food choripan — a sausage sandwich on a baguette with chimichurri, lettuce, tomato, and mayo.